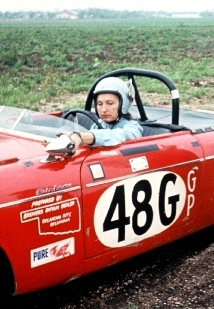 Beginning in 1986, Oklahoma Region named its Race Driver of the Year award after Elouise Norris, the best female race driver in Region history and arguably the best woman driver in the SCCA from 1964 through 1969. This is my recollection of Elouise and her contributions to the Oklahoma Region. My first memory of Elouise Norris was when she asked me to dance at the 1963 Oklahoma region awards banquet. She and her boss, David Dooley, had become friends with my parents and Elouise was gracious in dealing with my fumbling and stumbling steps. From then on Elouise and I were close friends, even though we grew distant as I married and raised my family. Elouise began racing in 1964 when she went to Driver’s School in David Dooley’s Alfa Romeo Guiletta. As secretary at Dooley Engineering, she managed all of David’s business appointments and got the bug for racing when she drove Dave's XKE in practice/warm-up sessions in 1963. 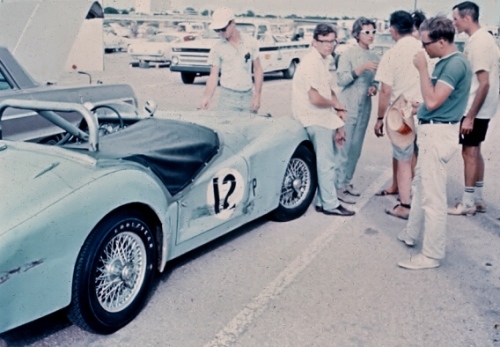 She bought a race prepared Triumph TR3A, had it repainted baby blue and qualified for the initial American Road Race of Champions (ARRC) at Riverside, California. She was the first woman driver to qualify at the ARRC, and in fact was the only woman driver to qualify for the first FIVE ARRC’s. She finished a very respectful 5th in F Production. She also won the Oklahoma Region award for Rookie Race Driver of the Year. During the 1965 season I crewed several races for Elouise, flat towing the TR3A behind her 1957 Ford Thunderbird. Elouise traveled on Dooley’s infamous school bus, meeting Greg Papin and I at tracks such as Corpus Christi, Austin, Independence Kansas, and Lake Afton. Elouise acquired a trailer by the ARRC in November, and she, her mother Sybil, my mother and I drove to Daytona in Sybil’s beige four-door Chevy. That was a trip to remember, worth re-telling in detail on another occasion. Elouise finished a disappointing 15th, although the competition at the ARRC had become much stiffer in its second year. 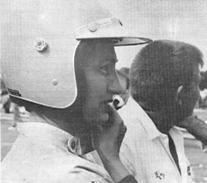 While at Daytona, Ray Brewer approached Elouise about driving one of his Datsun 1500’s in 1966. She said "yes". Jim Kellar, a noted Datsun driver in his own right, has these comments about Elouise’s Datsun exploits in 1966, “In her time racing the Datsun 1500, Ray Brewer and Elouise opened a lot of eyes. The sight of a ‘dumb girl’ racing a ‘Japanese Beer Can’ and ‘whooping the asses’ of the British Sports Cars (Sprites, Spitfires, MG Midgets, and Morgans) which at that time dominated the scene, was one to remember. Very few people knew what a Datsun was in 1965!" Jim continues: "Elouise probably weighed around 110 lbs. To see a little grey-haired old lady of this size drive so aggressively, yet always in perfect form, was a sight to behold. She and her Datsun were always noticed. I recall that the Oklahoma City SCCA drivers once held a high speed drivers seminar for the Oklahoma City Police Dept. Just imagine a person of her stature demonstrating to a big burly Cop how to drive his car at 120mph sliding sideways through a turn." 1966 was a very successful season, as Elouise tied for the Midwest Division G Production title, and again qualified for the ARRC. (For the first five years, only the top three cars from each Division were allowed to race). Unfortunately the Datsun failed to finish, which was the norm for Ray Brewer. His cars either won or blew up. 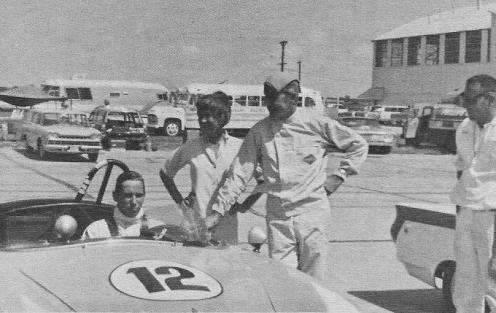 In1966 Elouise became the second female driver in Trans-Am history when she co-drove with Dave Dooley in his Lotus Cortina at the Green Valley, Texas 6 hour enduro. They finished 18th overall. 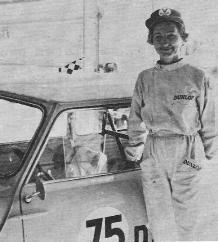 Susie Dietrich was the first woman Trans-Am driver when she co-drove a Mini with her husband Chuck at Sebring in March. 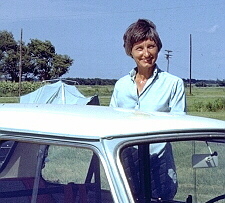 Disenchanted with the reliability problems of the Datsun, and impressed with the performance of the Overseas Motors Mini Coopers from Dallas, Elouise had Overseas’ “Mini Guru” John Sturgis set up a 970cc D Sedan Mini for her. Again painted baby blue, Elouise ruled D Sedan in the Midwest Division, taking the Division Championship three years running. She also stormed the ARRC, finishing 2nd, 3rd and 5th in 1967, 1968 and 1969 respectively. Driving her Mini she also won the 1968 Oklahoma Region Driver of the Year Award. Through out her racing career, Elouise was an active Driver’s School instructor, and many drivers learned the ropes from her. Elouise hung up her helmet at the end of 1969 and soon became a Steward. She served as Midwest Division Safety Steward for 1975 and 1976, and was MIDIV Executive Steward for 1977. She also served the Region as Corresponding Secretary in 1967 and Treasurer in 1971. Always a lady with hardly an unkind word about anybody, Eloise and I ironically locked horns in 1967 when she introduced and won a motion to discontinue calling the Speedy Lewis Rallye a “Memorial Rallye.” She thought it was macabre to name an event after someone who had died. In 1973 Oklahoma Region recognized her accomplishments by awarding her the Streeter B Flynn (Margaret England) Award. In 1985 the Midwest Division awarded Elouise the England-Stipe Award. This award is the Midwest Division’s highest honor. It is given to the Midwest Division member who has made the most outstanding long-term contribution to the club and to the sport. The award is named in memory of Margaret England and Mary Stipe, who were both licensed race workers. NORRIS Elouise, born at Jennings, Aug 5, 1921 to George & Sybil Vassar Norris. She loved her childhood in Tryon. Her self-sufficiency developed early after her fathers death when she was 12. She excelled in every endeavor through high school graduation at Chandler, A&M University at Stillwater and her business careers in banking at Stillwater, SOHIO Oil Co, OKC and executive assistant at Dooley Engineering Co. for 37 years. Her talents were many, she was a founding member of Women's Oil Association which became the Desk & Derrick Club, of which she was a charter member and president in 1956 & '57. She was an active and effective member of the Sports Car Club of America, she received National recognition as a motor car race driver and after retiring from active competition made major contributions to the procedures of conducting motor racing events. She was a devoted daughter and grand-daughter, a loyal, competent and tireless assistant to anyone who needed her help. She will be beloved and honored in the memory of everyone who was privileged to know her. Gifts in her memory may be made to the American Cancer Society.